This clearomizer is the little sister to our awesome ViVi Nova Clearomizer. It looks and functions similarly, boasting replaceable wicks and vapor clouds, but has a 2ml tank. This gives you the ability to take advantage of the ViVi Nova’s benefits without the size. It’s the way to go if you want a superior vaping experience with a smaller clearomizer. The ViVi Nova V2 has replaceable heads/coils/wicks just like the larger ViVi Nova. It is also 510 threaded, which means it will function on your eGo batteries. 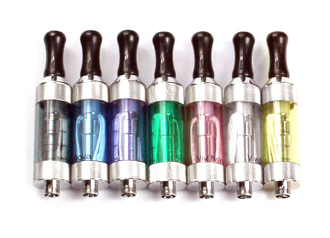 It also comes in some great color choices and you can change the drip tips so it’s completely customizable. It may even leak right onto your battery. Luckily our batteries are sealed, so all you would have to do is grab a paper towel and wipe it off. Sometimes the liquid can shoot out through the mouth piece. ** Over filling it leads to less smoke and you risk the chance of accidently sucking the liquid out.